Quit lolliking about an’ read this! Today’s The Weight of Words blog post began as tweets between me and my brilliant, artistic friend, Michael Ferguson. Mike lives in England, and right before the holidays, he came across the word crimbo in his tweet. I had a pretty good idea of what the word meant, but it generated a LOL and the request for an explanation. This prompted Mike to go all ar ter toke crate on me (I still have no idea what this means!) and provide a link that would help me decipher what he was saying. At least in theory the link was to have done this. 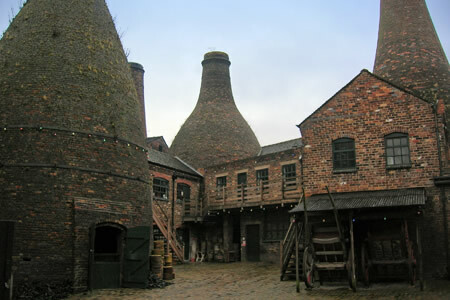 Since The Weight of Words, Writing Toolbox, and Research Road are all present to assist other writers in need, I thought the link Mike sent would prove most helpful to anyone wishing to write in the language of the Potteries, a North Staffordshire Dialect. As I scrolled through the list, I was quite pleasantly surprised to find that I recognized several words and phrases because I have heard them employed throughout my lifetime. I always believed them to be West Virginia-isms, but now I’m curious as to how these odd turns of phrase ended up in the mouths of my Mountain State ancestors when they have been credited to Stoke-on-Trent, England, and not Camden-on-Gauley, West Virginia. Goodnight, Irene. Have a Good Night. 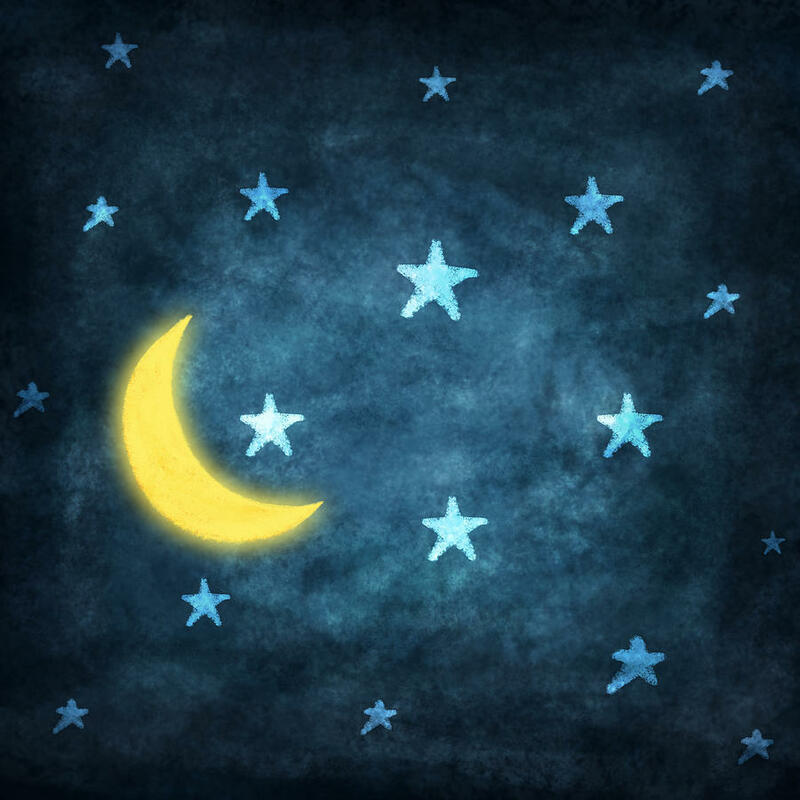 Today’s The Weight of Words blog post tackles the tricky question of whether you meant to write goodnight or good night. Picture yourself enjoying a night out on the town that has, unfortunately, come to a thrilling but exhausting end. Your friends have graciously delivered your slightly intoxicated self to your doorstep, and you send them off with kind words. At this precise moment, you experience brief clarity and decide that you must rush to your laptop to chronicle the exciting evening including your final farewell. If, in your parting statement, you meant to convey “Have a good night,” then you would type it as two words, good night. However, if your last comment was a benevolent wish upon your friends, you would type goodnight. Confusing? Not really. Just keep in mind that the first is an abbreviated form of “Have a good night” and the second is a pleasant wish bestowed. Breaking bad news is never easy. Receiving bad news isn’t much better. The only hope is that it doesn’t affect you directly, but even then, you may be called upon to share the grief and comfort those who need it. But what do you do when the bad news is disguised as a lovely dinner with your friends and slips out through the course of pleasant conversation? Factor in the knowledge that the bad news is tiptoeing dangerously close to your own awful experiences, and the situation is bound to go south. Such was the case for Dr. John Welles when he accepted an invitation to dine with Reuben and Hannah Wise. What began as an enjoyable meal with people he knew for years turned out to be a hidden request for assistance with a task that John absolutely does not want to complete. Not even Hannah’s delicious cooking could persuade the doctor to go against his conscience or dredge up painful secrets. By the time the Wises and Dr. Welles parted, not even the sweetness of Hannah’s homemade applesauce could soothe hurt feelings or smooth over the rift between them. 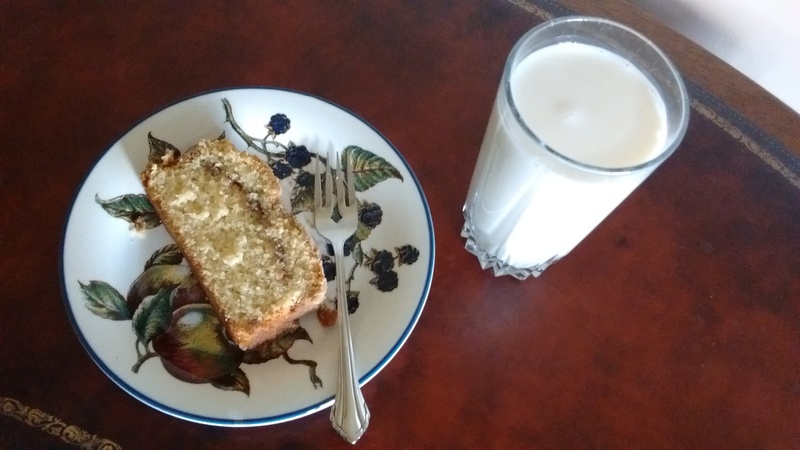 The following recipe is the one I had in mind when I wrote the above-mentioned scene. As with many recipes, there is room for change based on your preferences. 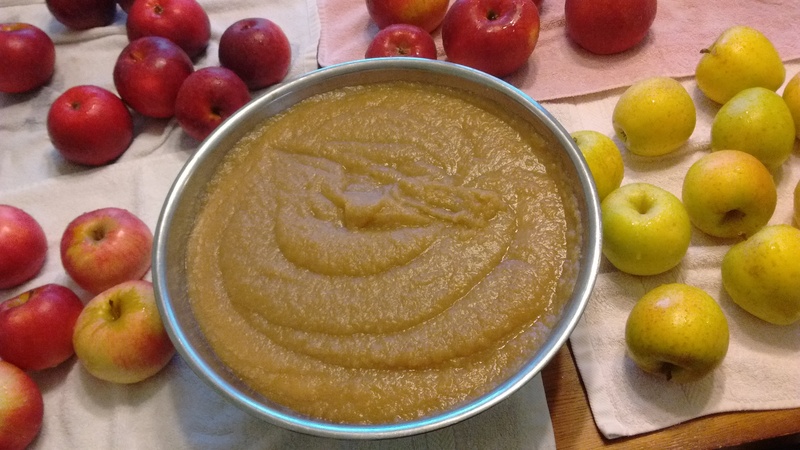 I find that applesauce, not unlike apple pie, is one of those recipes that bear the signature flavors usually handed down through the family. I hope you enjoy the way my family makes it. My favorite apples to use are Cortland, Jonagold, Melrose, Idared, Winesap, and Golden Delicious, and I use a combination of all six in this recipe. Stotler’s Orchard is where I purchased apples for saucing. I prefer to use a 6.5–quart cast iron, enamel covered Dutch oven, but any heavy cooker will do. Peel, core, and cut enough apples into one-inch chunks to fill the cooker, leaving a little room to stir. Add the apple cider, brown sugar, vanilla, cinnamon, and several hearty dashes of allspice to the apples. Stir all ingredients, cover, and cook on a medium high heat. Don’t let the apples boil. Check regularly and stir the apples up from the bottom so the mixture cooks evenly. At about 30 minutes, the apples should be soft enough to cut through a chunk with the side of a wooden spoon. If not, cook for an additional five minutes and recheck. Once the apples are tender, transfer small batches to a food processor and blend to desired consistency. I allow the applesauce to cool to room temperature in a large metal bowl before transferring it to gallon-sized freezer bags. 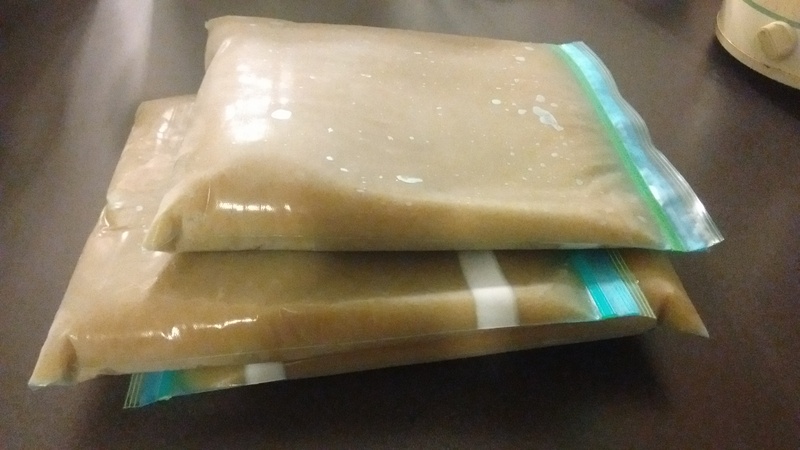 Enough applesauce is ladled into the bag so that it is about a half inch thick when sealed and laying on its side. Full bags stack nicely in the freezer. ***If your allspice lists several other spices in the ingredients, you’re not using real allspice.